When it comes to compensating employees, the possibilities are endless. Wages and salary (and perhaps bonuses) usually come to mind first. However, non-cash benefits are a great way to appeal to a variety of employees. Non-cash benefits (aka alternative compensation) may also offer you more options for motivating your teams, some of whom may value flex-time or other benefits even more than cash. 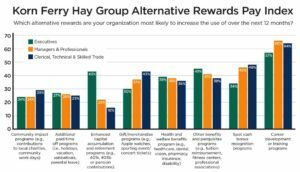 Korn Ferry Hay’s 2016 Alternative Employee Rewards Study (the most recent edition) notes that alternative compensation is on the rise, with employers responding that they were likely to use eight different types of alternative compensation more in the following year. Ninety percent of respondents already used four or more of these methods. Let’s take a quick look at four of these methods, and how they can help keep your employees engaged and motivated. Although flexible hours and/or remote work aren’t possible for every position, they are very important for some workers. If parents are able to pick their kids up from school or spend more time doing anything else besides commuting, the perk of flexible hours can make a great ongoing impression. Additional paid time off (PTO) is appreciated by every employee—if they’re allowed to use it. Employers need to normalize PTO usage by making it a part of the company culture. It’s counterproductive to award nominal time off and then discourage people from taking it. Make sure your benefits have a high perceived value, even when no cash is involved. More than half of the respondents in the Korn Ferry Hay study said they were likely to increase their use of career development as a benefit in the following year, making it the most popular type of alternative compensation. This isn’t just about giving people extra employee training. The idea is to groom your next generation of leaders. This isn’t an exclusive benefit just for the C-suite either; companies have been expanding their career development options for managers and other professionals including clerical, technical, and skilled trades. One of the best ways to motivate people is to help them do something that matters to them and improves their communities. This is especially important for positions that don’t seem directly related to those things; if you’re at a call center constantly trying to achieve high monthly and quarterly metrics, it can be hard to see how you’re helping your community. Being given the opportunity to directly create positive impact can end the monotony and form a lasting impression. Different companies handle this differently. For instance, REI’s Yay Days are meant for employees to get outside, promoting a company culture of love of the outdoors. Giving employees PTO Volunteer Days and Charity Days is another way to go. Properly-structured incentive programs are dollar-for-dollar more effective at motivating employees than cash alone because they involve more than just great rewards. They’re based on public recognition of achievements, preferably by ownership or senior management. Recognition and rewards programs are everywhere (Aon Hewitt surveys have revealed that 91% of businesses have one). The problem is that many programs are half-baked, poorly introduced, or inadequately promoted in the workplace. In fact, there are lots of potential pitfalls with points-based employee incentive programs that employers need to be aware of. Poorly-structured and administered incentive programs are worse than doing nothing at all. Failing to deliver customized rewards based on specific achievements can be counterproductive by making the recipient feel anonymous and even less appreciated than before. That’s why it’s important to offer rewards that are worth getting and form a solid structure for employee incentive programs.